Learn more about this SEMA featured Lexus LS 460 F-Sport featuring JDM goodies and Vossen CV3-R Wheels. Its literally 4am here in Chiba, Japan a few hours before the Tokyo Auto Salon opens where Vossen will be showcasing there for the 7th year. My body thinks it is in Miami, where it is 2pm so I am full awake. Since this is my personal vehicle, its easy for me to talk about the car and the parts on the car but I was looking for that energy and motivation to complete this feature. Naturally, I found it being in Japan. In the LFA yellow Lexus IS feature, I recapped quite a bit of my “Lexus Life” so I won’t rehash those thoughts here. I’ve always respected & admired the Lexus LS but it never really aligned with my wants. Three crucial things things then happened, the latter life altering. 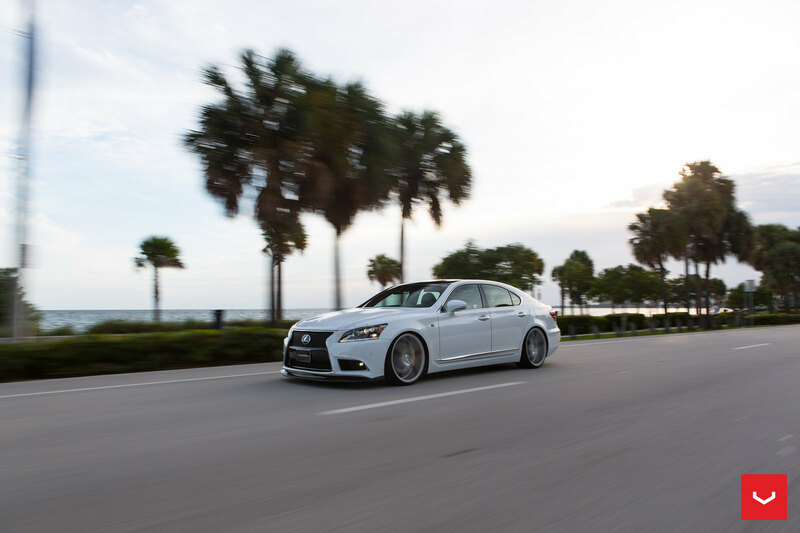 The first was the addition of the LS F-Sport model with the updated 2013 model. I fell in love with the new style and the F-Sport touches & for the first time it was a LS I really saw myself in. The second was going to Japan for the first time and meeting Lexus at the new “Intersect by Lexus” as well as a two day tour of various Lexus & Toyota related facilities. It was an influential experience getting to meet and know the company I greatly admired in their homeland of Japan. Finally, my wife and I were expecting our first child who you know today as “Mini-MIke”. My GS 450h at the time was a joy but with limited trunk space it wasn’t close to ideal with a kid on the way. I evaluted many different choices from the new Audi A8 diesel, to the BMW M5 and even the Tesla Model S. If you are wondering why I didn’t consider the natural step, the new Lexus GS F-Sport, well, my wonderful wife has a modified one. There were so many tantalizing options but to those that know me, know I am extremely loyal and Lexus has been an amazing company to know and work with, not to mention being associated with the world’s largest Lexus news source, the Lexus Enthusiast. I also know our Vossen wheels are perfectly engineered for the LS and there was huge aftermarket JDM support. Also, I wanted to do something different since there are not many 2013+ modified LS vehicles. I worked with Lexus on getting this car built and my friends at JM Lexus handled everything amazingly. On March 17th, 2014, she arrived from Japan. Like many of you, I had a pretty good vision on how I wanted to modify my LS, which meant accenting the body lines without overpowering things. I met Skipper Design in Japan during my trip to Japan and saw how high quality the products were in person and realized also how cool they were. We also featured their GS 350 kit here and fit and finish was perfect. Thus went on their full Carbon Fiber Kit featuring front lip, front bumper garnish and rear diffuser. I love the classy yet sporty look of the Skipper Design parts with the front lip in particular being the part most people fall in love with. Also note I replaced the stock exhaust tips for quad Skipper Design pipes and the rear roof spoiler is painted black. You might also note that my roof is indeed black. All modifications as well as the painted roof were done by my good friends at Exclusive Motoring. Roly and his team have been amazing to work with in modifying my LS and insisted the roof be painted and not wrapped. I agree with their decision. The LS F-Sport comes with many different upgrades to the standard LS. The front and rear bumpers are different, the interior gains F-Sport seats, pedals and real aluminum trim for example. In regards to performance, the 8 speed automatic programming is changed with it being the only LS with paddle shifters and it comes standard with the AVS suspension. You also get 19″ wheels and two big upgrades, a true Limited Slip Differential & huge Brembo brakes, with the fronts being huge 6 pot, 14.9″ sizes brakes. One thing I’ve learned, you can never have enough brakes. I called up my good friends at Race Technologies where our pal Greg gave me all information on their even larger 16″ upgrade for the LS. A true two-piece disc, I chose the Brembo GT system which was lighter and offered even better braking capabilities over the stock system. For those wondering why the rear brakes are untouched, for now only a front system is offered. After installation I noticed pedal feel was greater with just amazing stopping capabilities. The LS F-Sport comes standard with a factory air suspension which adjusts based on your speed and can be changed slightly with factory settings. JZS International was called where they quickly shipped an aftermarket Air Data Control Module which allows me to raise and lower the vehicle. Note how low the car is in the first pics and its slightly higher in the picture above. It really is invaluable especially since we ride low at Vossen! Vossen Forged VPS-313, where is was showcased in the Vossen x Lexus booth SEMA 2014. The feature wheels here are the “renowned, refreshed & Refined CV3-R. Personally I love accenting the sporty look of the LS F-Sport and the CV3-R does that extremely well. It also shows off that beautiful yellow Brembo Brake. The CV3 clearly ushered in a new age of concave wheels nearly five years ago with it maybe being the most replicated wheel today. The updates to 2015 were numerous including the new colors gloss graphite and metallic gloss silver as seen below. Nearly two years later the LS has really perfectly it my needs. The huge 18 cubic foot trunk is perfect for the stroller, bags and other items we need for Mini-MIke. The interior is much larger than our GS and makes life easier. The car has been flawless in regards to issues and quality though I do wish for more power as the 386hp V-8 is adequate for most but I desire more. At car meet and events, it is usually the only 2013+ LS in attendance so its cool to talk about what can be done to this unexpected modified car. What’s next? Well I will see what JDM parts are being showcased at Tokyo Auto Salon this weekend to see if I give her (I’ve named the LS Big Bertha) a last update or set my sights on something new, like that stunning Lexus LC 500 which debuted Monday. With of course Mini-Mike now being a part of the buying process! It is now 6:30am, the sun is rising and off to get ready for an amazing day with TeamVossen!